It’s been raining here for what seems like years. I think we’ve only had one full day of sun in something like 4 or 5 weeks. I’m still in winter comfort food mode. Some people think it’s the end of their world when they’ve been diagnosed with food allergies. Being dairy free and gluten-free isn’t really all that difficult. It can be done, and it can be done well. You don’t have to deprive yourself of all of the comfort foods life has to offer. 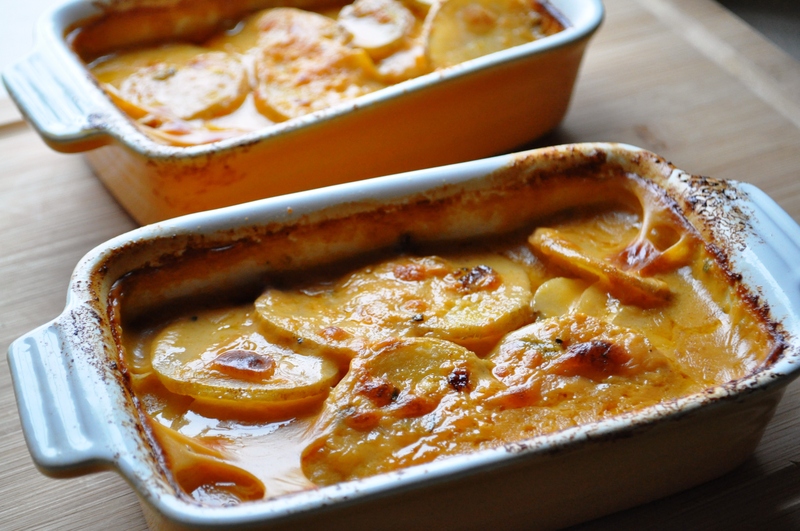 Scalloped potatoes are definitely one of those comfort foods I would certainly hate to say goodbye to forever and now I don’t have to. If you have a favorite holiday food or special side dish that you can no longer “have” because of allergy limitations, get creative. Carve out a little time in your schedule once every couple of weeks to experiment with your favorite dish. Do some research, use the original recipe as a starting point for measurements, etc. 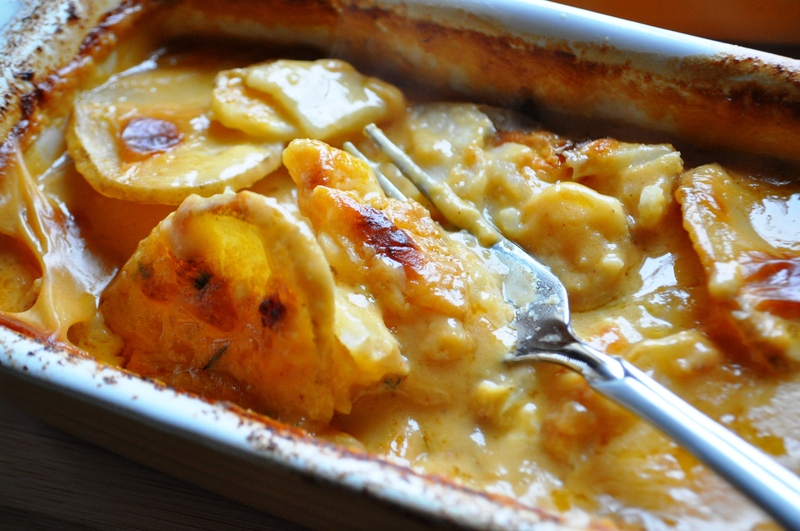 This recipe is adapted from Food Network Magazine’s recipe for Mini Scalloped Potatoes. I used it as a starting point so that I would have a balance between the solids and liquids. 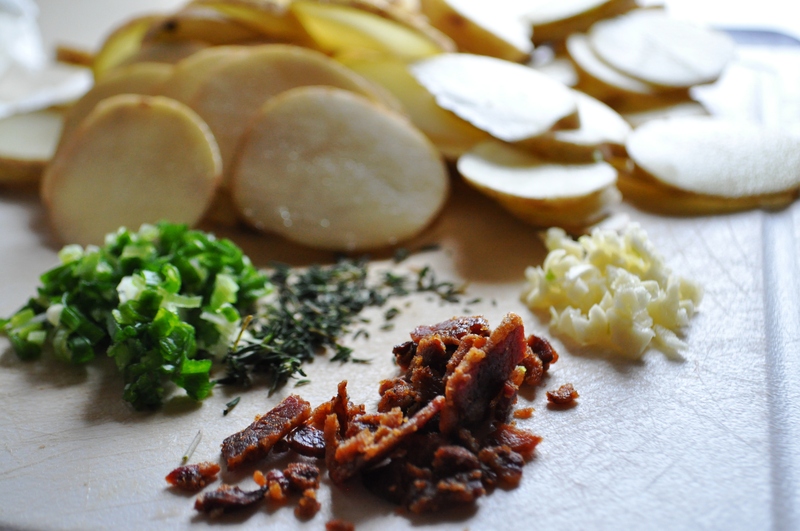 Then, I added garlic, green onion, thyme, paprika, bacon, sheep’s milk cheese and exchanged the dairy ingredients to non-dairy ingredients. It’s really just as easy as that. Living allergen free does mean that a little more work and patience is required on your part. 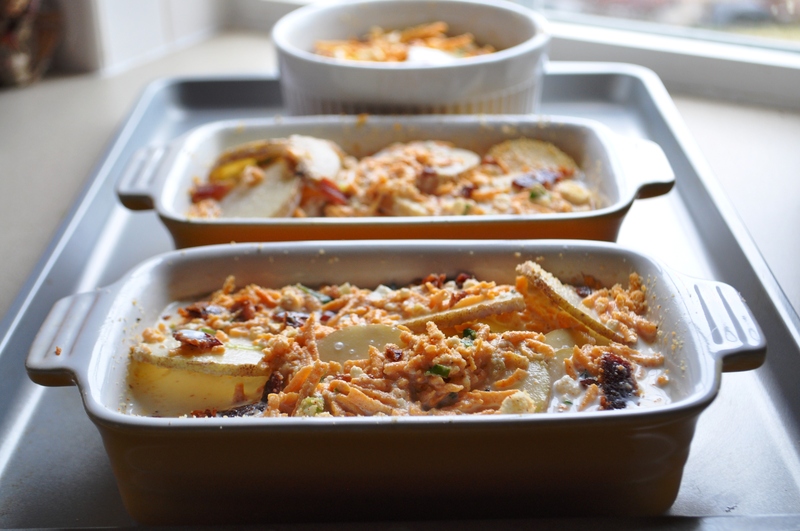 But it certainly does not mean that you will need to learn to be happy with less tasty and satisfying meals. 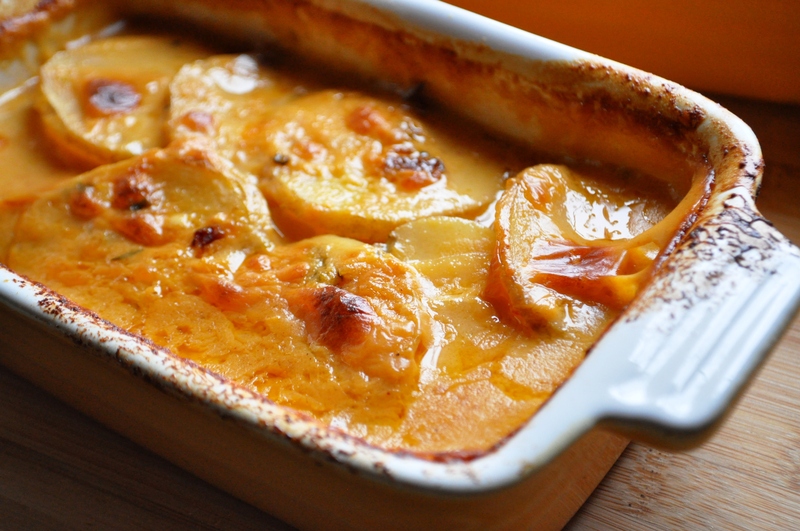 These scalloped potatoes are 100% dairy and gluten-free. Perfect alongside your upcoming Easter ham. Preheat oven to 350 degrees. Generously brush ramekins (I used 3 oversized, their recipe calls for 6 – 6-8 ounce ramekins) with the melted butter and set aside. I don’t think it would quite fill an 8×8 baking dish though. If you plan to have it with a holiday meal, I would double the recipe. 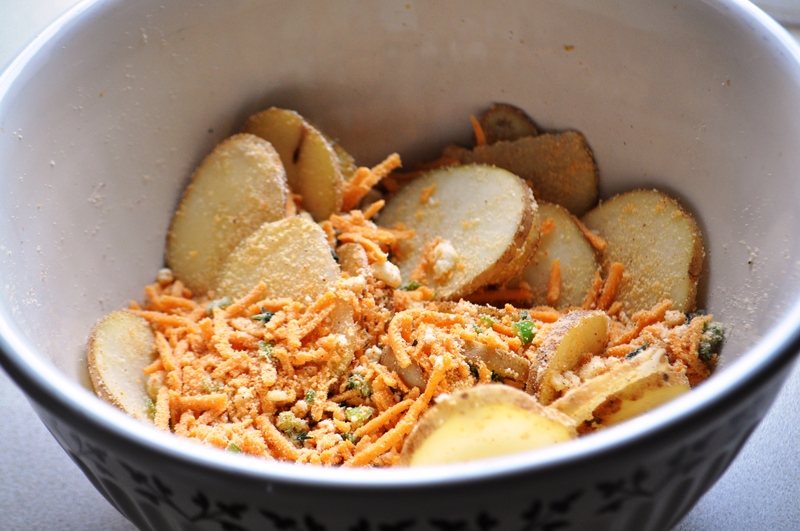 Combine the vegan cheddar, vegan parmesan, sheep’s milk cheese, onion, garlic, thyme, paprika, salt, pepper, and potatoes in a medium bowl. 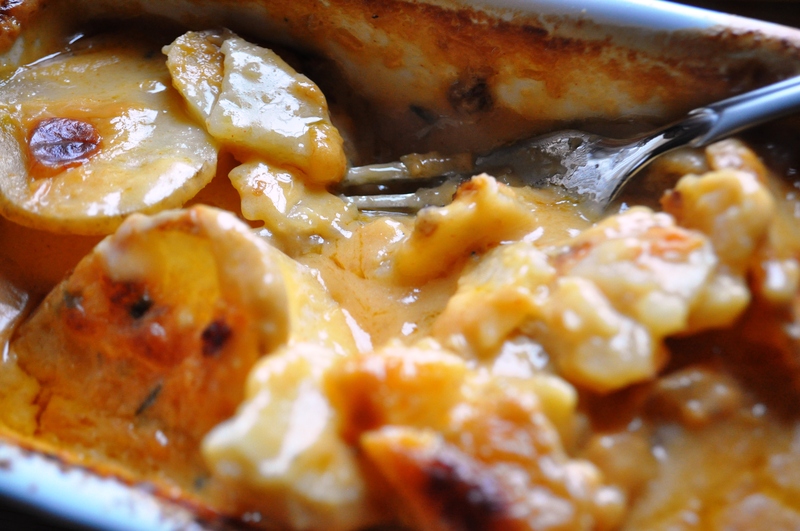 Divide half of this mixture among the ramekins, arranging the potatoes around each ramekin and distributing the cheese mixture as evenly as possible. Top with half of the non-dairy cream. 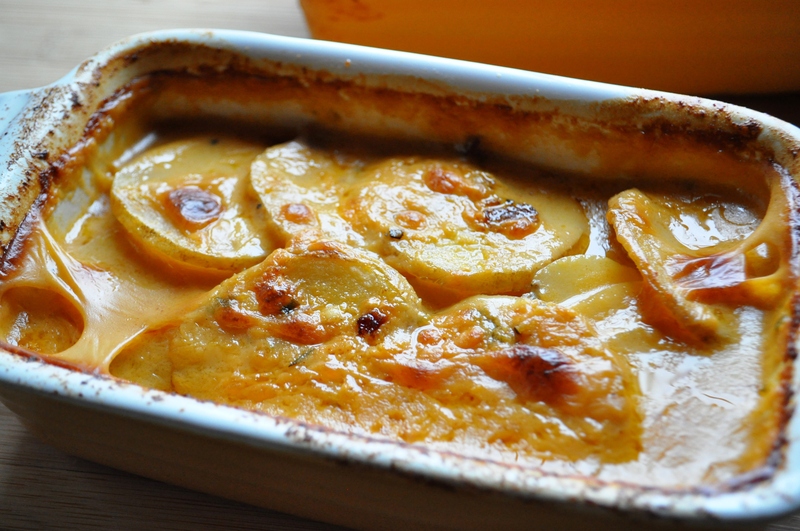 Repeat with the remaining potato and cheese mixture and cream. Sprinkle with crumbled bacon. Cover with tin foil and bake for 40 minutes. Remove tin foil, increase oven temperature to 425, and bake for another 20 minutes. Thanks Cecelia! I’m actually allergic to dairy, not just intolerant. I wish I could drink whole unpasteurized milk! I used to be able to eat real butter, but even that eventually started making me ill. Now any dairy at all and I am VERY ill for at least 3 days. It doesn’t stop me from falling off the wagon once or twice a year though. I ate ice cream not too long ago at Cold Stone. It was the first time I had ingested dairy (on purpose without being poisoned by a family members meal) in about a year and a half. Trust me, it really wasn’t worth it. There are so many alternatives that it really isn’t necessary to fall of the wagon again in the future. I have to give you credit, April. You’re just not going to take this lying down! You’re not going to give up your favorite foods nor are you going to settle for something inferior. You’re clearing a path for yourself and leaving GF crumbs for others to follow. That’s pretty awesome! Wowzah, I don’t really have a gluten allergy, but I’m going to be making this one just like you describe. Looks delicious!! !